The 2017 SUPER HUGE Michigan Wine Month Giveaway has ended! The 2017 SUPER HUGE Michigan Wine Month Giveaway has ended! Thanks to all who participated this year — we hope you had fun and learned a ton about Michigan wines and wineries that you may not have been aware of! It's the FINAL day of the 2017 Michigan By The Bottle SUPER HUGE Michigan Wine Month Giveaway! 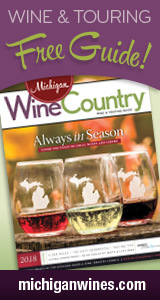 We hope you've enjoyed this year's contest, and we hope you'll continue to tune in to MichiganByTheBottle.com throughout the year as your go-to source for Michigan wine info! Today's Prize: An MBTB prize pack: A unisex MBTB-logo Drink Local shirt, an MBTB corkscrew, a four-bottle logo wine tote, a logo DropStop, a logo bottle stopper, assorted other goodies and a $10 gift card, redeemable at any MBTB Tasting Room location. Prize must be picked up from MBTB Tasting Room; winner can choose between Royal Oak, Shelby Township and Auburn Hills. Today’s Question: Through MichiganByTheBottle.com, we aim to promote the entire Michigan wine industry, and at our three MBTB Tasting Room locations, we've partnered with several Michigan wineries to bring local wine closer to Metro Detroit. What have you learned or discovered by following MichiganByTheBottle.com and/or visiting MBTB Tasting Room? Today's Prize: A Black Star Farms Experience Package! Includes an Estate & Wine Tasting Tour for 2 (valued at $50), $25 in Hearth & Vine Café Dining Dollars, and a $25 Black Star Farms gift card, redeemable at either of Black Star Farms' two Traverse City area tasting rooms or online at BlackStarFarms.com. Today's Prize: Private Wine Tasting Tour for up to 22 people! We believe wine should be approachable. Fenn Valley tours have been designed to help take the mystery out of making world class wine. We aim to strike a balance between education and entertainment. Luckily, the subject matter always keeps things interesting! Our tours are pretty in-depth. They run about 1:45 in length, and involve wine tasting throughout to illustrate the various points being made. Depending on the time of year and weather, the tour will be outside in the vineyards, in the cellar, or a little of both! Winner will need to coordinate their tour with the winery on a mutually agreeable date. Today’s Question: Who would you bring with you on your Fenn Valley tour? Tag at least one person in the comments and say why they should come along! Today's Prize: TWO WINNERS TODAY! Each winner will receive two logo glasses, a free tasting and a cheese plate. Today's Prize: Vineyard tour and wine tasting for two people at Dablon in Baroda. Must be arranged at a mutually agreeable time. Today's Prize: Laurentide vineyard tour for four people! The winner and his/her guests will accompany Laurentide's owner to the vineyards for a one-hour tour. After the tour, the group will be invited to enjoy a complimentary tasting in complimentary Laurentide logo glasses at the tasting room. Tour must be arranged on a mutually acceptable date/time during the current growing season. Offer expires 12/31/17. Today's Prize: Free tastings for two with the winemaker + 25% off any purchase at Resort Pike, which opens July 1 in Petoskey! Winner will need to coordinate visit with Winemaker Matt Killman. Today's Prize: FREE wine tasting for up to six people — which includes five separate 1 oz samples, a chocolate from Patricia's Chocolate and a souvenir wine glass per person — at Lazy Ballerina in St. Joseph.